"Literature needs great writers, but just as importantly it needs great encouragers of writing — selfless and undaunted initiators prepared to devote their energy to create vital outlets where new writers finally find an audience. For thirty-five years Jessie Lendennie has been such an encourager and instigator; a motivator, lynch-pin and unstoppable force presiding over the miracle that is Salmon Poetry. This anthology is a celebration of her journey, of Salmon’s journey and the journey of Irish poetry over this period when Salmon has been a vital presence in launching so many writers out into the world." Jessie Lendennie was born in Arkansas, USA. After years of travel, she settled in Ireland in 1981. Her publications include a book-length prose poem Daughter (1988), reprinted as Daughter and Other Poems in 2001 and Walking Here (2011). She complied and edited: Salmon: A Journey in Poetry, 1981-2007; Poetry: Reading it, Writing It, Publishing It (2009); Dogs Singing: A Tribute Anthology (2010); and, Even The Daybreak: 35 Years of Salmon Poetry (2016). She is co-founder (1981) and Managing Director of Salmon Poetry. Her poems, essays and articles have been widely published and she has given numerous readings, lectures and writing courses in Ireland and abroad, including Yale University; Rutgers University; The Irish Embassy, Washington D.C; The University of Alaska, Fairbanks and Anchorage; MIT, Boston; The Loft, Minneapolis, MN; Café Teatre, Copenhagen, Denmark; the University of Arkansas, Fayetteville; The Irish American Cultural Centre, Chicago and The Bowery Poetry Club, New York City. She is currently working on a memoir To Dance Beneath the Diamond Sky. Salmon Poetry’s celebratory anthology highlights its list of Irish, American, British and European poets, all of whom represent the vibrancy of contemporary literature – distinct in style, voice, and geography. This much-anticipated event will feature readings from Seamus Cashman, Mary Dorcey, Jean O’Brien, Mark Granier, Colm Keegan, Mary O’Donnell, Maurice Harmon, Alvy Carragher, Anne Hartigan, Phil Lynch, Alan Jude Moore and Patrick Chapman. Free admission but booking is essential. 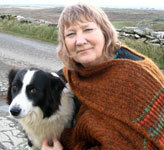 Salmon Poetry, co-founded by Jessie Lendennie, started life in Galway with a poetry pamphlet, thirty-five years ago. Since then it has moved to County Clare and has become, as poet Eavan Boland says, “one of the most innovative, perceptive and important publishing houses in the UK and Ireland.” For the first ten years Salmon published a poetry journal and since 1985 it has published volumes of poetry – hundreds of them! 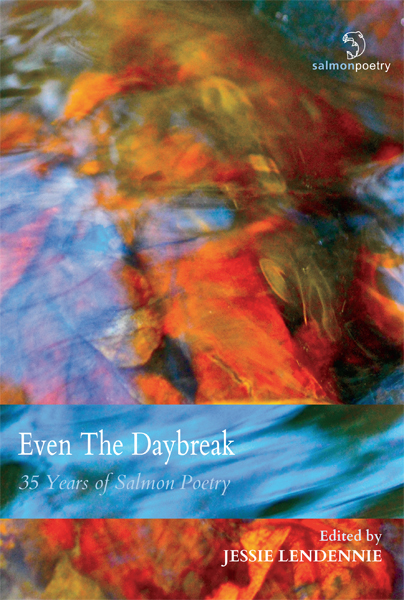 This anthology celebrates those thirty-five years by including poems from many of the writers, ordered in the book by the year they first published with Salmon. That’s 267 poets and nearly 300 poems! There are biographical notes on each of the contributors (several from County Clare, including Jessie herself, Knute Skinner, Frank Golden and Ilsa Thielan), and a bibliography of the volumes Salmon has published. At 482 pages, it is a marvellous collection that is a joy to read. It is beautifully produced, with a stunning cover. If you enjoy poetry, it will be a lovely book to add to your collection. If you are an occasional reader, it will give you the chance to discover new poets from among the huge breadth of writers.